Window Replacement • Best Buy, Professional Installation! Window replacement projects have a large amount of options to choose from. One type, insert windows are made specifically for direct replacement. If you have double-hung windows with frames that are in good condition, there is another easy option. It involves removing old sashes and inserting a window replacement into the old existing frame. Insert replacement windows are specially designed to save you time and money. They fit into your existing wood window frame without removing interior or exterior trim, so there’s less disruption to your home, and its original character is preserved. You simply remove your old window and install the new insert window in the existing opening. Another advantage: You can do it from inside your home, which makes a big difference in labor cost if you’re replacing windows on the second level. If you have Andersen Narroline® windows made after 1967, Anderson’s Narroline Conversion Kit makes an even easier replacement solution. The quick conversion kit can turn them into convenient, tilt-wash double-hung windows with high-performance Low-E4® glass. It installs easily with less mess than ordinary window replacement. Plus, it matches your existing window inside and out and is backed by our full Owner-2-Owner limited warranty. All Anderson replacement windows, like the new replacement casement window and tilt-wash double-hung insert window, are available in custom sizes for a precise fit. You’ll enjoy instant comfort with virtually no maintenance, plus energy savings and long-lasting beauty. When replacing windows, you should know that building codes often require egress windows—ones that can be used as an emergency exit. Casement windows are often your best choice for egress, because they provide a larger passageway than double-hung or gliding windows. And here’s another Andersen advantage: If the other windows in your home are double-hungs, Anderson’s 2¼-inch-width grille running across the center of a casement window simulates the look of a double-hung. If you’re replacing old casement or awning windows, Andersen makes replacement windows specifically for the job. They come full prepped for easy installation with the nailing flange removed, holes predrilled, and a convenient installation kit including screws, shims and flexible foam backer rod to help you install like a pro. If you’re planning to replace a group of windows, consider replacing them with a bay or bow window to provide a beautiful interior cove that can make a room appear larger. 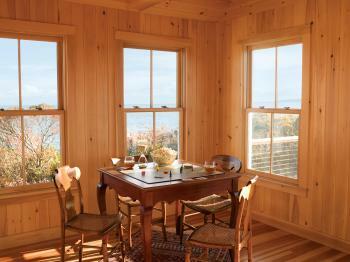 A wide range of double-hung, casement and picture window combinations is possible. We use many different suppliers for windows both new and replacement; Anderson is a solid choice and has been serving the area for many years.